The brain MRI has evolved substantially over the past two decades. Specially designated sequences or “images of brain slices” (epilepsy protocol MRI) are used at most epilepsy centers to provide the most precise brain structure details possible. This makes it easier to determine if any regions of the brain are showing signs of abnormality. This test is non-invasive and involves lying as still and quiet as possible on a gurney in a special room. 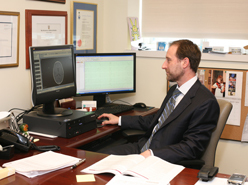 The test can be performed on an outpatient basis or following V-EEG monitoring. It should be noted however that in a number of cases no abnormalities are identified through MRI.